Restate the purpose of recurring donations. Nonprofit Success Pack's recurring donations feature helps you efficiently track gifts that donors give regularly over a period of time. NPSP supports open ended recurring donations and fixed length recurring donations. 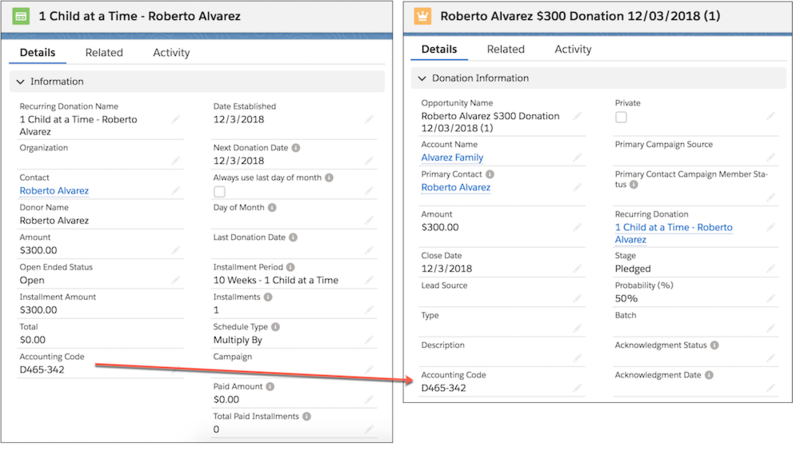 When a user creates a recurring donation, they determine the type by setting the open ended status field. This value is used for fixed length recurring donations. It creates the correct number of installments based on installment period and schedule type. There are no new installments added unless the number of installments or schedule type are updated. This value is used to create open ended recurring donations. It creates opportunities based on the installment period, but instead of creating installments it bases the number of opportunities on the forecast month setting in NPSP settings. This value stops an open ended recurring donation from creating additional opportunities. 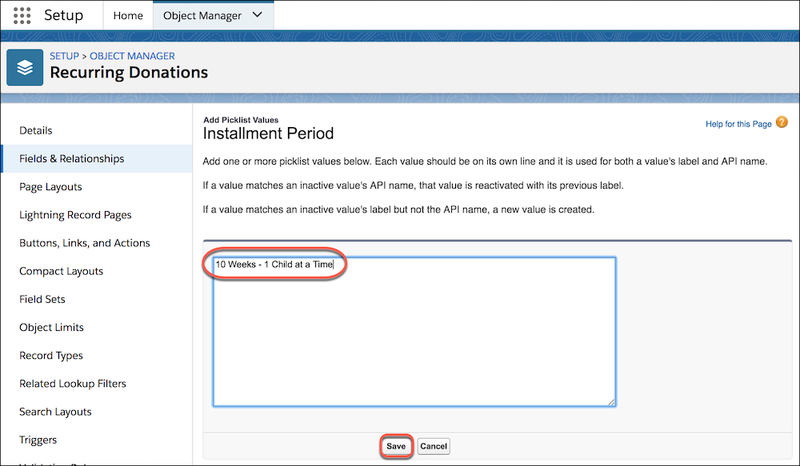 Existing open opportunities are handled based on the behavior specified in NPSP settings. 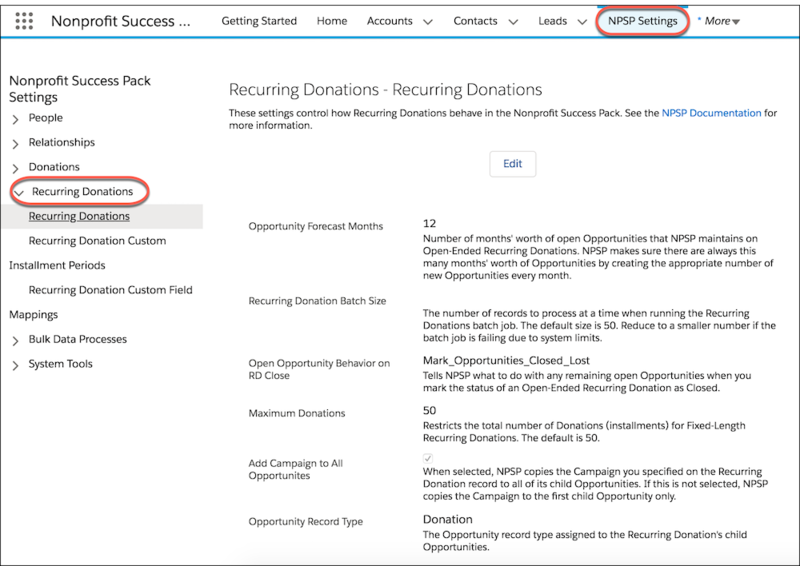 Before your team begins using NPSP's recurring donations feature, you'll want to understand, confirm, and possibly edit your recurring donation settings. 2. Click Recurring Donations > Recurring Donations. Most organizations find the default settings meet their needs, but again, you can change these values at any time. Check out the NPSP documentation listed in the resources section of this unit for more details on these specific settings. You can create additional installment periods if you need them. Creating custom installment periods is a two-step process. You need to create the custom installment period in NPSP Settings and then add the custom installment period to the actual Installment Period picklist field on the Recurring Donation object. At the No More Homelessness nonprofit, they ask donors to support after-school programs for homeless children through a regular contribution. Specifically, they ask donors to give $300 every 10 weeks to support after-school services for one homeless child during each of five annual program sessions. Our NMH admin Gorav is going to add a custom installment period to be able to use recurring donations to automatically create and manage the opportunity records from this program. 2. Click Recurring Donations > Recurring Donations Custom Installment Periods. 3. Click New Custom Installment Period. 5. Enter a Time Period Frequency and select a Time Period Type. Gorav enters 10 weeks. 6. When you're finished, click Create Custom Installment Period. The installment period is created...but Gorav isn’t finished. Now he must next add the custom installment period to the picklist field. 2. 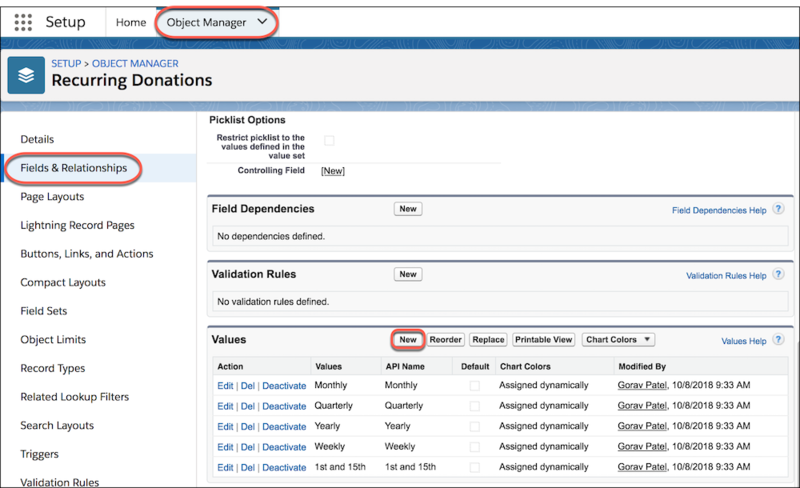 Click the Object Manager tab. 3. From the list of objects, click Recurring Donations. 5. Click the Installment Period field. 6. In the Values list, click New. 7. Add one or more installment periods. Each value must be on its own line and must be identical to the corresponding picklist name. Now let’s take a look at a recurring donation record created with this new installment period. 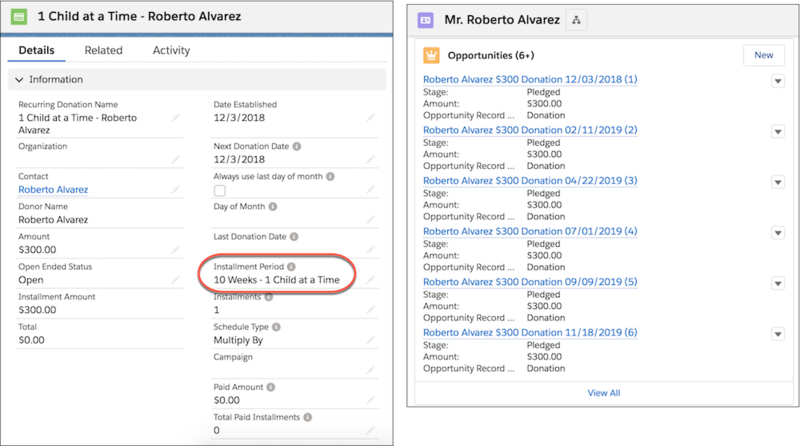 The NMH development associate creates the recurring donation for Roberto Alvarez and we can see NPSP takes over the work of creating the upcoming opportunities. 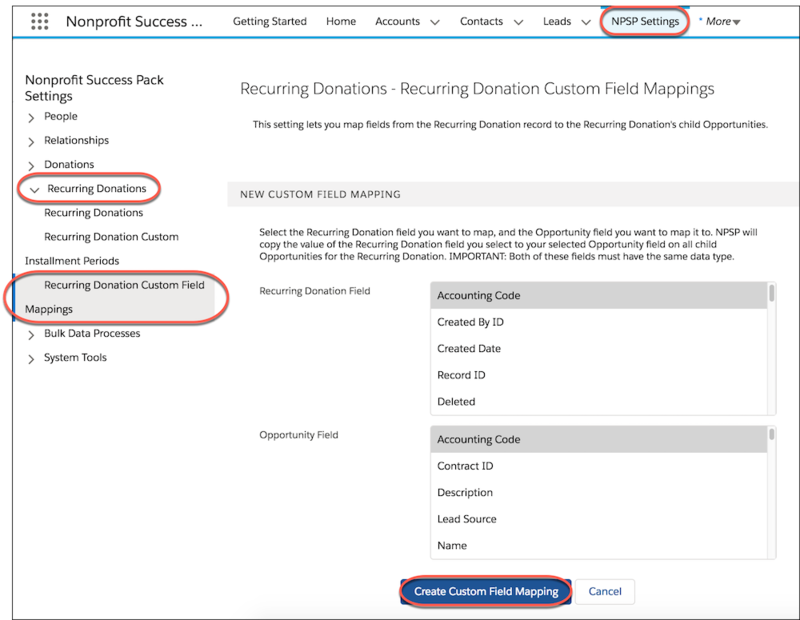 You can use recurring donations custom field mapping to copy custom fields from recurring donation records to child opportunity records whenever you create a new recurring donation. 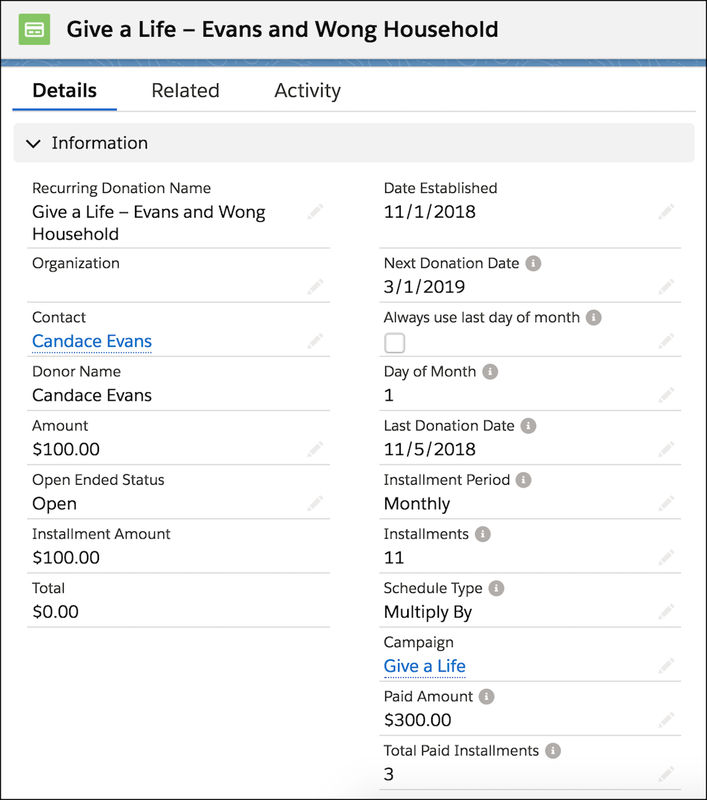 You may want to do this so that details from the recurring donation record appear in child opportunity records as well for easy reference or billing. NMH, for instance, tracks an accounting code on their opportunity records. Gorav, our NMH admin, wants to be sure that the accounting code that typically gets entered on their opportunities also gets added to all the opportunities created by a recurring donation record. Let’s follow along as Gorav maps that custom field on the opportunity record to the recurring donation object. Mapping requires that you have two fields (one on the recurring donation and one on the opportunity) of a matching type in order to create a mapping between them. 1. Make sure you've created the custom field on the recurring donation object. 2. Click the NPSP Settings tab. 3. Click Recurring Donations > Recurring Donations Custom Field Mappings. 4. Click New Custom Field Mapping. 5. In the Recurring Donation Field list box select the custom field you created on the recurring donation object. 6. In the Opportunity Field list box, select the corresponding field on the opportunity object. 7. Click Create Custom Field Mapping. The new field mapping appears in the mapped fields list. Now when a user in the NMH org creates a recurring donation, the accounting code from the recurring donation record is added to all opportunity records created by that recurring donation. The recurring donations batch process runs every night to create any additional opportunities needed for recurring donations. You can also run this batch process manually, which is recommended if you change your recurring donation settings. The process will create the correct number of opportunities based on the new setting values. If needed, you can adjust the batch size. All you need to do is go to NPSP Settings, and under Bulk Data Processing > Recurring Donations > Recurring Donations Batch, click Run Batch. That’s it!